For generations Jewish girls collected and played with their Barbie Dolls. Yes, both Barbie and Ken looked quite Aryan but I don't believe many little Jewish girls were complaining about their dolls' non-Semitic looks. Now, all of a sudden, there is a plethora of very Jewish looking dolls on the market. I know this because I was escorted through the American Girl Place in Chicago this past August by my own little Jewish doll. She grabbed me by the hand and dragged (yes, dragged) me past dozens of dolls to show me the elaborate display of American Girl's answer to religious pluralism. And that's when I met Rebecca Rubin for the first time. Rebecca Rubin is not a stereotypical Jewish girl. At least not from this century! She's a cute little brunette growing up in New York City in 1914 (think Fievel from "American Tale" but a little girl instead of a mouse). Rebecca Rubin now lives with our family. We've adopted her, but she's maintained her Rubin sir name and Lower East Side Depression-era attire. As if Rebecca Rubin doesn't look quintessentially Jewish enough, my daughter can beJEWel her even more until this doll has been tricked out with the Jewy-ist accoutrements imaginable. For $68 (that's not a typo), Rebecca can enjoy a beautiful Shabbat with "The Rebecca Rubin Sabbath Set." (For much less than $68 I can feed my family a delicious Shabbat dinner, complete with brisket and wine.) The Sabbath set is advertised as featuring "everything Rebecca's family needs to celebrate the Sabbath: A Russian samovar and tray for heating water and serving tea, a tea canister and a ceramic teapot, two glasses, pretend hallah bread and a scalloped cloth, a pair of Sabbath candles that the women in Rebecca’s family 'light' before sundown, and two blue candlesticks that were a gift to Rebecca from Mr. Rossi." Based on the price of the set, I just assumed those candlesticks from Mr. Rossi were real silver and that I wasn't getting ripped off too badly. The Rebecca Rubin doll sells for $100. With all of her hyper-Jewish accessories, figure the total investment will be around $18,000 (and that's before Rebecca Rubin even starts day school). If the Rebecca Rubin doll is too Old World Jewish for your daughter's taste then there's a whole crop of more modern Jewish dolls on the market. I learned this from an email I received this morning from the Jewish version of Groupon called JDeal, which is offering Gali Girls at a 37% discount today. Not only are these Jewish dolls less expensive than Rebecca Rubin, their less expensive than her candlesticks! Advertised as "Learn and play the Jewish way! 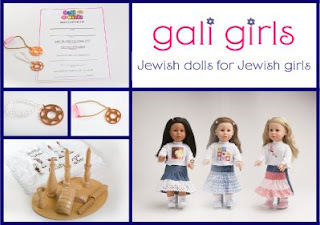 Gali Girls gives young Jewish girls an opportunity to bring positive Jewish values into their doll play, and create a connection between the contemporary Jewish girl and her heritage. While the majority of dolls in today's market focus on fashion and makeup, Gali Girls reinforces the positive Jewish values that have kept the Jewish people alive and growing for 5000+ years." Based on the description, it looks like each of the Gali Girl dolls even comes with a Shabbat kit (in addition to a Jewish star bracelet for herself and her new owner, and a Hebrew/English name birth certificate). Not only that, but the Gali Girl dolls' clothing is compatible with American Girl dolls. And if your daughter still wants her doll to have the nostalgic immigrant look of Rebecca Rubin, there are Gali Girls options like Shoshana who lives in colonial New York. 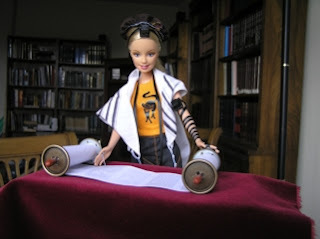 If you're looking for something more feminist and egalitarian for your daughter than either the Rebecca Rubin American Girl doll or the collection of Gali Girl dolls, might I suggest this post-modern religious Barbie doll created by Jen Taylor Friedman, a Torah scribe (yes, a female Torah scribe!) in New York. 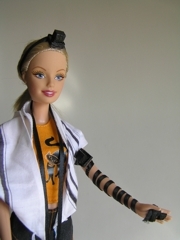 The Tefillin Barbie Doll can be purchased on her website and comes in various options including a computer engineer Barbie Doll wearing a tallit and tefillin. 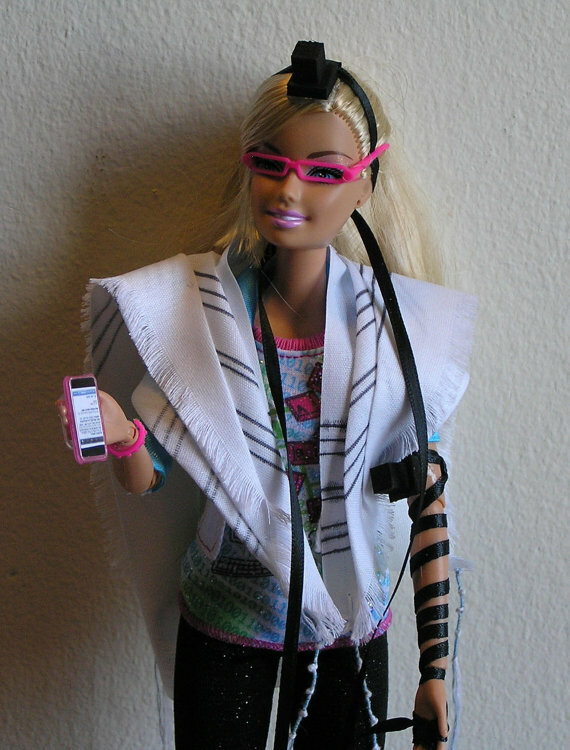 A Mattel Barbie with tallit, tefillin and book from the Talmud sells for $130 and Torah scrolls are an additional $40. If your daughter doesn't want the standard looking blonde Barbie, you can send Taylor Friedman any Barbie Doll and she will wrap her in the traditional Jewish garb. All I can say is, "Barbie... You've come a long way baby!" Has your daughter read the All-of-a-Kind Family books yet? They'd be a wonderful supplement to this doll. I found the blog regarding Jewish dolls most enlightning. In years past I didn't have to worry about the religion, race, or ethnicity of dolls having had 4 bogs, but now I have 3 beautiful granddaughters- the oldest is 15 1/2 and interested in other things, so this blog can prove quite informative. Todah Rabbah. As usual great post. Just for your record: the name Rebecca Rubin, is shared by an American Girl doll and... an infamous eco-terrorist. Second Rebecca Rubin, now 38 years old, known as "Little Missy", is listed as "armed and dangerous" by the FBI for her alleged involvement in groups that led two of the biggest eco-crimes in U.S. history - the 1998 bombing of a Vail, Colo., ski resort and a 2001 explosion at an Oregon power plant. Please take a look at: www.minimishpacha.com It is a full line of reasonably priced Jewish dolls, covering the entire family of 13 different dolls. Each doll comes complete with various Jewish accessories. Unbelievable Blog. Your blog surprised me will the dolls.